Unfortunately, reaching Sultanahmet by public transport is difficult and will involve multiple methods of transport. There is, of course, the option of taking a Sabiha Gokcen airport taxi which can be much more convenient, but due to the location of the airport quite a way out of the city, much more expensive. The ride can be about 90 minutes and cost around 28€ (140TL). The Havabus from the airport will not go to Sultanahmet but will deliver you to two locations – Taksim Square 2.40€ (12TL) or Kadikoy 1.80€ (9TL), therefore you will need an alternative mode of transport for the onward journey from both locations, either ferry and tram or metro and tram. If you wish to take a bus from the airport, you will need to take the Havabus, which operates routes to either Kadikoy or Taksim. Both routes will require you to take either a ferry/tram or walk/tram to reach your next destination. If you go to Kadikoy, the journey will take around 60 minutes. You will then need to catch the ferry from Şehir Hatları dock to Eminönü, approximately 15 minutes, then take the T1 Kabataş/Eminönü-Bağcılar tramline from Eminonu to reach Sultanahmet – this will take another 10 minutes or so. 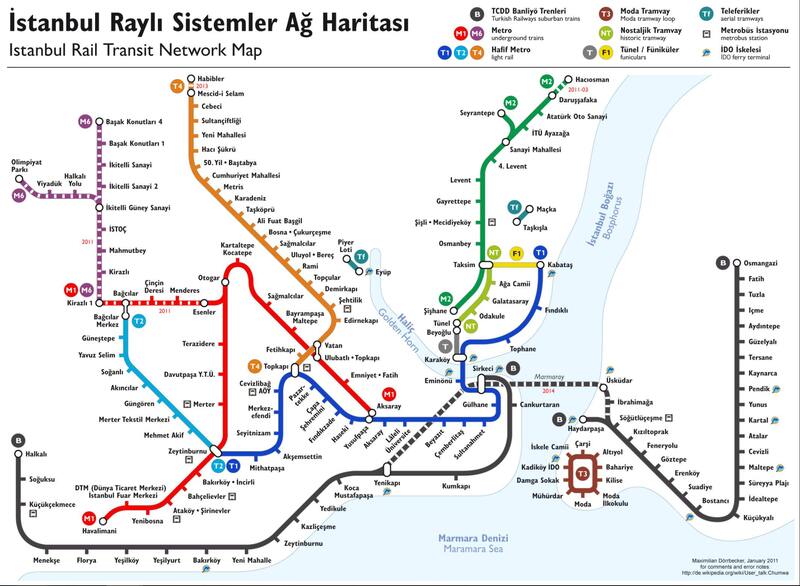 If you go to Taksim, the journey will be a little longer – around 90 minutes. You will alight at Taksim and then walk to Kabatas (10 min) to take the T1 Kabataş/Eminönü-Bağcılartram line to Sultanahmet. This additional transit journey will take perhaps an extra 30 minutes. How much is the bus from Sabiha Gokcen to Sultanahmet? The bus to Kadikoy will cost 2€ (10TL), as well as the additional ferry cost of 0.40€ (2.15TL) and the tram cost of 1€ (5TL). The bus to Taksim will cost around 2.40€ (12TL), along with 1€ (5TL) for the transit on the tram. If you purchase an Istanbulkart you will receive a cheaper rate on these journeys, at 40% discount. However, the card is purchased at the airport for 2€ (10TL). The card can be used on the Havabus, tram and metro. The bus to Kadikoy or Taksim will run from Sabiha Gokcen between 04:00am - 01:00am, leaving every half an hour. The bus is available from outside the arrivals terminal at Sabiha Gokcen Airport. The bus, although a good and cheap option, does not get you to Sultanahmet, and therefore additional methods of transport can add extra hassle, time and cost to your journey. For this journey it is most advisable to take a pre-booked taxi. Sultanahmet is often called "Blue Mosque" in English on the trams after the beautiful mosque in the area, it is worth a visit! The Istanbulkart is a fantastic multi-use rechargeable travel card which provides great discounts if you are often using public transport. If you are multiple people, you only need one Istanbulkart for everyone, just top up the amount needed and scan it for each person. If you wish to reduce the travelling time, you can always take a taxi to Sultanahmet from Taksim – this should cost around 5.60€ (17TL). By taxi is the most efficient and direct method of transport to reach Sultanahmet, especially if you have children or lots of luggage as public transport can be very busy. However, since the airport is located far outside of the city, this comes at a price. Taxis are located outside of the airport and will be yellow. They should always display a meter in the cab that should be on as soon as you enter the vehicle. The taxis in Istanbul are metered, and the journey is long (approximately 80 minutes). Therefore, if you wish to take a taxi, be aware that the cost can be up to around 28€ (140TL) to reach Sultanahmet, dependent heavily on traffic. The journey by taxi is the most efficient way to reach your destination in Sultanahmet from the airport at Sabiha Gokcen and has 24/7 availability. However, it is more expensive than public transport and a metered fare means that traffic can affect the price. It is always best to book a taxi in advance to lock the price as there is a long distance between the airport and Sultanahmet and often lots of traffic. Always take out cash in TL before you take a taxi. Only take taxis from the rank - don't accept rides from people who offer them to you. There are certain ways to the city that require a toll, discuss with your driver if he will take these. How much is a taxi from Sabiha Gokcen Airport to Sultanahmet? A taxi cost from the airport is metered, so an approximate cost of the journey is 28€ (140TL), however traffic can affect this price estimate. How many transfer options are there from Sabina Gokcen Airport to Sultanahmet? There are 2 transfer options available, but the only direct route is offered by taxi. If you take the bus, you will either need to take the ferry and tram or walk to take a tram from the drop off point. What is the distance from Sabiha Gokcen Airport to Sultanahmet? The distance from Sabiha Gokcen Airport to Sultanahmet is approximately 47km and the journey will take around 60 minutes by taxi in normal traffic.